Our conversation the last few weeks has centered around the concept of faith. This series has been one of my favorites here at Sacred Margins. So if you haven’t read the previous posts, I encourage you to catch up as we draw it to a close. I so appreciate the fairness and thoughtfulness Glass shows in this interview. What I find particularly interesting about this situation, though, is that while I want to defend my Christian brothers and sisters, I kind of understand where the secularist viewpoint is coming from. As a minister, I obviously know tons of Christians whose faith makes them incredibly generous and kind and merciful and loving. This is the exact opposite of some of the portrayals we see. But at the same time, I often find myself uncomfortable with the way some Christians talk about their faith. I think that there is almost this pressure a Christian feels to live life with certainty. Which we should on particular matters, but that doesn’t mean that we’re certain about every aspect of life, as if nothing is a mystery and everything is easily understood. There are times when I hear Christians talk about issues of the spiritual realm or gender issues or stem cell research and genetics or ancient history with such assurance. As if as because we are people of the Bible, answers are our birthright. This is where I think someone with a secular point of view can get crossways with the Christian. Because although I believe the Bible points us in a particular direction on many of these issues, it doesn’t exactly tell the whole story. I think science and human experience also have a voice in these matters. So when Christians talk about these types of complicated issues with such certainty, I get it. It can appear archaic and closed-minded. Even backwards. Faith can so easily become a position to be rooted in, an stance that must be defended. For many Christians, this is the way faith works. It gives them the answers they need to make sense of life. So they see God behind every detail. When an opportunity presents itself, it’s a gift from God. When an opportunity disappears, it was God’s protection. They see God pulling the strings of their life all day long. It’s obvious. Certain. Which makes me feel like a bit of an outsider because that is just not me. I don’t see the world that way. Maybe faith is spiritual gift that some are blessed with that helps them make sense of life easier than the rest of us. Perhaps others’ faith is simply stronger than my own. I often wonder where God is and what he is doing. I see hints and clues when others see obvious evidence. What role does faith play if it doesn’t always lead me to certainty? Here’s what I know with absolute confidence: I am captivated by Jesus. The way he interacted with everyone around him. His radical inclusion of the outsider. His graciousness even to those who would do him harm. His sacrifice. The way that his teaching is still revolutionary in the world. How every time I try to follow his way, things seem to work out for the good of everyone, no matter how counter-intuitive his way appears. So I try to align my life with Jesus. I want to point everything I have and am in that direction. I want to understand what it means to be like him — to see others with such grace, to treat everyone with such mercy, to give of myself in ways that build love and community. This is what faith is about to me. It’s not a position to be held or an opinion to be argued or a stance to be defended. 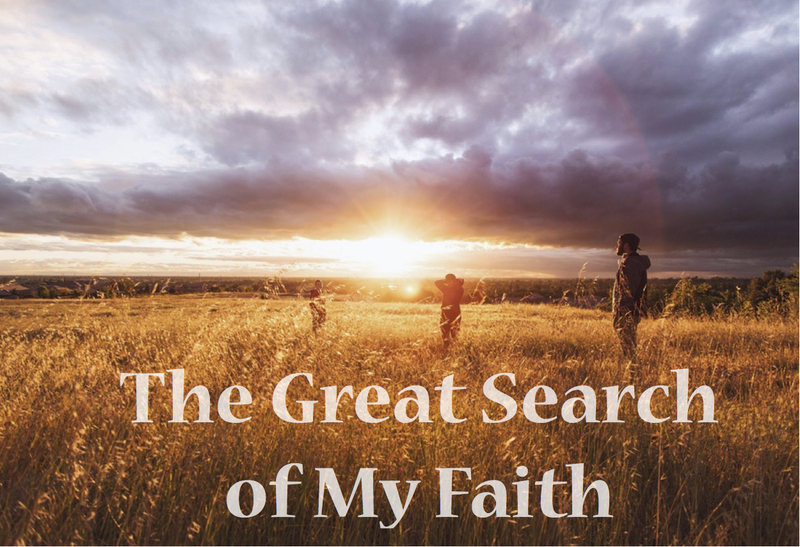 Faith is a curious search to find truth and meaning. Because I may not understand how the universe works, but I see the hints of something more behind everything. I have this suspicion that there is much more meaning and depth to the day than what appears on the surface. And Jesus seems to know what that is. He claims to be truth and every time I test him on it, I see more of it for myself. So I align myself with Jesus. I try to see the world his way and interact with it in ways that he would. And while this may not lead me to certainty in all things, it gives me a growing certainty about who is the source of all things. So I will continue this great search of my faith. This entry was posted in Uncategorized and tagged Bible, Certainty, Conversation, Culture, Doubt, Faith, Ira Glass, This American Life. Bookmark the permalink. I have watched this video several times now and I really appreciate Ira Glass and his honesty here as well as the gracious nature of the host. They appear intent on having an honest discussion as opposed to trying to cram life into their individual narratives. Interestingly, Jim Henderson (the guy doing the interview) is also the person who bought an the Friendly Atheist’s (Hemant Mehta) soul on Ebay. Which Hemant then later wrote a book about. Jim even invited Mehta to share the experience with several churches that he had planted. I just really admire people who are not afraid or intimidated by the “other”. There is much to be learned by trying to understand the nuance and complexities of someone else’s point of view. And it is not just that they are willing to have these conversations, it’s that they come away valuing each other as friends.